For once, Gerard being on the same wavelength as Abby didn’t bother her. She nodded in appreciation. “Parky, too, once his pumpkin came loose,” said Claude. “A whole bunch of people who need — want — help with their mental issues,” said Claude. “No?” said Abby. “You try to do something, and no matter what, you fail. You fail and fail and after a while, you get desperate enough to destroy everything in the name of ‘making a change’ just so you don’t have to fail anymore. I understand that mindset better than you can imagine.” She chewed distractedly at the edge of her broken nail. “Anyone who knows the stories knows you don’t make a deal with the Devil. You always get screwed over. But maybe that was the other side of the plan. Make everyone in town crazy, and no one knows you’re a failure anymore.” Abby stopped and yawned, long and loud. Everyone else caught it and yawned themselves. “…That’s no good,” Abby said. “We’ve got maybe three hours until sunrise, and a lot of work to do if we’re going to stop this.” She jogged out of the room and returned a few minutes later with a small green box with LOSE-4-GOOD printed on its side. “Take one,” she said, shaking out a card of pills and popping those pills from their plastic blisters. “We need to stay awake. Every rich family has someone hooked on diet pills — amphetamines. It’s like, a law or something. These will wake us up until we either…well, succeed or not.” Claude took a pill, and Fleur, but Gerard balked. “Like fun you can’t,” Abby said, and thrust the pill at him insistently. Gerard nodded, blushing a bit, and left the room. “Except we’re surrounded,” said Fleur, looking ready to flinch for having pointed out a flaw in Abby’s plan. The citizens of Caliche had been kind, ever so kind, to put Abby and the others in a house where they could all find warmer clothes that fit them. Now, dressed in comfy layers and coats, they walked out of the house into a chill night they barely felt. Abby felt even less. Since her wave of annihilation upstairs and downstairs, she was gripped by a weird calm. Anger had gone, it seemed, and left nothing in its place. She was fine with that. Anger was good for demolition. It had no place in surgery. The townsfolk tightened their grips on each other’s hands. “So from what I understand,” she said, stepping closer, “y’all are all scared of me and my friends. To tell you the truth, at first I thought that was silly — we four basket cases, too angry or worried about peoples’ opinions or freaked-out or doped-up to be any threat to anybody — what’s to be scared of? The pumpkins didn’t react, but Abby could see vines loosening and tightening — fidgeting, almost — along the chain. She paused for breath, leaning forward, hands on hips. No one and nothing spoke. Abby straightened up. “…And I’m not saying my friends and I are perfect, that we have some moral high ground over you. I’m not. But I am saying we have strength you’ll never have, none of you, alive or dead. We screw up — again and again. I’ve fallen more times than I can count; so has my friend here,” and she jerked a thumb back in Gerard’s direction. “Sometimes we fall, and we climb back so slowly it looks like we’re barely moving. Sometimes we fall, and we lose sight of which way is up, and we wander for ages. She took one step back: the only one she needed to take. As she watched, the members of the chain let go of each other and collapsed to the lawn. She couldn’t tell if the pumpkins forced the humans down or if the humans broke control and caved despite the pumpkins’ commands. But they all went down, and they all stayed that way, shivering and twitching on the grass, all whispering things she was glad she couldn’t hear. She didn’t need to look back to see if her friends followed; they all walked right by her side. Notes: Tonight’s post (if I have time to get it done) will catch me up! I’m attempting to write a Halloween-themed horror novel in October! Visit Day Zero for more information, and check out Countdown to Halloween for more blogging that’s altogether ooky! 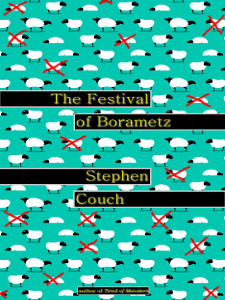 The Festival of Borametz -- eBook now available! 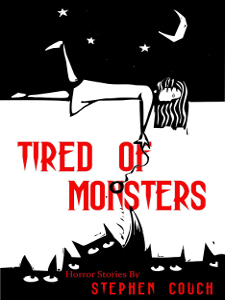 Tired of Monsters -- eBook now available! Blog contents (c) 2019 Stephen Couch, unless otherwise noted. Author photo (c) 2019 Jason Lee.